Enjoy your best action hero Akshay Kumar’s (Akki) action song Hum Na Chhodein Todein Phodein lyrics with video song. You may read Hum Na Chhodein Todein Phodein lyrics in English and Hindi translation. 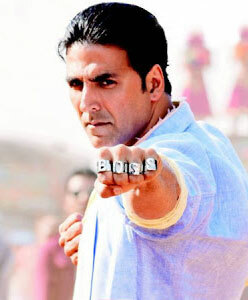 The song is taken from Akki’s upcoming movie on 16 October 2013 that is “Boss” with female actress Aditi Rao Hyder. Read and understand the complete meaning of this song in Hindi and English translation. Re passe ne hat ja re tau..
Pata ko ni ke tane..
Hum hain baki sab juban ke yahan.. ghulam hain..
Aate jaate hamko thokate salam hain..
Apne hi usool pe chale yeh zamaana..
Hamne hi to ladkiyon ka dil hai dhadkaya..
Aye taau boss chala gaya..